For 656 consecutive days, Chelsea Hodson photographed and wrote about one object she owned until all 656 of her material possessions have been accounted for on her blog. Originally conceived as a way to structure an essay, Chelsea’s Inventory had grown into an unexpected and insightful collection of anecdotes, lyrical poetry, aphorisms, and notes from her reading — in sum, an autobiography in objects. If capitalism is religion, her impeccable self-portraits and seductively economical prose have the aura of a modern Madonna. In collaboration with the Marina Abramovic Institute, Chelsea also performed the catalog in its entirety in one seven-hour marathon reading session. (She fainted after ninety minutes of standing and resumed sitting for the rest.) To conclude Inventory this way was not at all surprising — how much can the body endure? is a question that Chelsea probes over and over in her work, and this was another endurance test for her to pass. The complete effect of Chelsea’s deceptively unruffled reading is mesmerizing: You might wish you can walk away from Inventory like you can walk away from a painting, but if you really pay attention, you won’t want to. Chelsea and I met to chat about Inventory three days after the performance. In the rain one evening, the glass-walled library at The Oracle Club in Long Island City glowed at street level like a human habitat display box in the Museum of Natural History. At one of the desks built into the antique shelves, Chelsea sat working with giant headphones, perfectly poised facing the wall. I didn’t know why I thought whispering her name in slow exaggeration on the other side of the glass pane would break the spell, but that was the kind of black magic Chelsea would inspire. Over tea we talked about the surprises in performing, why autobiographical writing is the most compelling writing, and her fascination with the trials and failures of what one body can do. I didn’t expect the experience of watching the performance to be so physical. I watched it at home and kept having to turn it on and off. It hurt to have no control over someone reading on and on and to imagine what the reader is going through physically and mentally. I was actually reminded of Marina Abramovic’s “The Artist is Present” as antithetic to Inventory, in the sense that Marina’s performance was completely silent, while this is completely filled by a voice, but both of them force themselves on your attention, at least formally. Marina is a huge influence on all my work, but I hadn’t made that direct connection. I saw Inventory as more insular. The project is so much about objects: Why did I keep this thing through four moves; why would I move it across the country, or what significance does it hold, or why do I have ten of the same type of object? To show that object was a big part of Inventory, so in the end, I wanted to see what would happen when there’s nothing in the room and you read the significance of the objects without their presence. I liked the forceful action of reading it the whole way through and not letting anyone stop listening. Even though I knew, of course, people would not stay for the whole duration. People came in and out throughout the day. Was 656 really the number of every object you owned? Yes. I had more objects when I started Inventory in Los Angeles. I knew that I was going to move to New York in four months, so I started keeping track of what I was keeping and what I was getting rid of and documenting the boxes I was sending through the post office. Did you know that you were going to read through the entire catalog aloud when you started the project? I didn’t have the performance in mind from the beginning — that came as the narrative progressed. I thought it would be really important for me to read this all the way through once it was done, aloud, as a performance. Yeah, it was. Mostly I just like completing things. I have a few OCD-type habits. I have to see things through to their end. Once I started this clinical cataloging, I had to know that I could complete it all the way. What was the physical experience of performing the piece? I did. It was quite early on. I thought sitting would be boring, so I tried to stand the whole time. But being anchored to the microphone, I didn’t move my legs enough. At #155, I could feel blood going out of my head and I couldn’t see anymore. I was reading from memory. I thought, I’m gonna finish it, and then I will tell them I need a chair. You turned really pale at one point. I don’t know why I thought I could even finish it. I got halfway through the page and announced that I was about to faint. And then I grabbed the microphone and collapsed out of frame. You can see the microphone jiggle. I almost wanted to get a back-up person just in case. But at a point in the performance, I reached a stride, and I felt like I could keep reading for three more hours. It felt good once I sat, like a train chugging along. I felt the support from certain people who were there throughout the day. That really helped. There were also points in the piece where I just felt so sad that the piece was ending that I felt like I was going to cry, and I had to power through that. I didn’t expect that. Throughout the piece, I would be reminded that the piece is ending in four hours, and three hours…and I felt so connected to it. Were you sad in a way that made you wish you could continue the project? I’m relieved that it’s over. It served more as a diary than I had intended it to. The nature of how I write is so autobiographical that I would come across pieces that I hadn’t come across in over a year and be reminded of something being really painful or really sad. That was surprising to me. How did reading Inventory aloud change your relationship to, or memory of, the objects compare to when you were writing about them with them in the room? I felt that they all blurred together. When I put all my attention on one object, there’s a tendency to romanticize it. But when they’re viewed as small parts, they feel meaningless in a way. I felt detached from most of the things by the time I read Inventory aloud. You started the project wanting to rethink why did you buy and keep certain things. How did Inventory change the way you consume? At one point, I got really sick of doing Inventory, and I got rid of a bunch of stuff. Yeah, kind of. But I also just didn’t want them. Like, enough! So that was one thing. Doing Inventory then led to Pity the Animal and thinking about other themes, like what it means to be an object and to be objectified as a woman. Pity the Animal was actually something I had started before Inventory and didn’t know how to finish. I almost kind of solved the problem of the essay by writing Inventory. A mostly efficient one — I hate dawdling or browsing too long. Most of my shopping is done online. How human beings are objectified through being watched has been a major theme in your writing so far. How did you first become conscious of the possibilities of objectification and commodification through surveillance? I’ve always been voyeuristic, so I’m always interested in how other people view me, or what draws people into wanting to watch something. One of the first instances I can remember is court reporting in journalism class. We watched this really horrific murder trial and I could not look away. The act of reporting on something that intimate stayed with me for a long time. I am most drawn to art where the artists expose themselves completely, whether visually or based on memory. Anything that says this is me, this is completely me is what I’m most connected to, all the time. That’s what I aim towards, even when I’m writing about myself. It’s a way of having others watch me. When I’m writing about myself, it often involves things that don’t make me look good. I think it’s really important in that kind of writing to acknowledge that you’re not the hero of any situation. I think what makes writing about yourself interesting is acknowledging and exploring that, because that’s the case for everyone. And there are so many ways to do that. Part of what’s beautiful about your writing is that, sure, you write about yourself, and Inventory is autobiographical, but the tone is not self-indulgent. I appreciate that. I think some people would say otherwise. I mean, the act of what I did, showing myself that way, was self-indulgent. But I view it as just another extension of what I believe to be true: that everybody has their story and it deserves to be told if you want to tell it. I believed in doing this catalog, so I did it. That’s all it takes. And that’s all I think it should take. 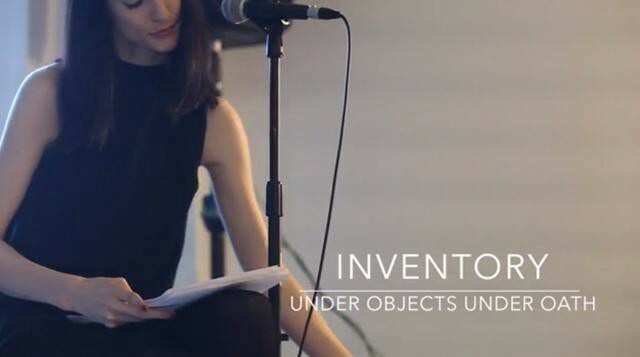 Inventory certainly wasn’t meant to be a celebration of everything I own; I just saw it as a structure. In one of the entries, you wrote, “I grew up ordinary and was fighting it all the time.” Why did you think you were ordinary and in what ways were you fighting it? My new essay in The Lifted Brow kind of touches on that. I always felt like I wanted to say more things, but I felt too shy to make my voice heard the way I wanted it to. I viewed myself as ordinary because I thought nobody else would see me as extraordinary. It took me a long time to find a way to tell the story I wanted to tell. I was so quiet and shy. I was always best friends with the troublemaker because I was always very afraid to act on certain things. I guess I viewed that as ordinary, too, when really, I was taking everything in and keeping it because I have an excellent memory. In a way, this failure to act on certain things I wanted to do is more interesting now. It’s like being the “Almost Girl.” You’d be on stage, but playing a small part. Or going to Marina’s “The Artist is Present,” but not sitting in front of her. It’s a recurring theme of my life! I’m always trying to push that boundary, but I can’t quite get there. Marina has that piece where two people put their finger out and barely touch for six hours, that’s how I feel sometimes. Very small things have a very big impact on me. For me, being very close to doing something is the same sensation that someone else would get from actually doing it. But at the same time, you also did an exhausting long durational performance. Why put your body under duress? Getting to that limit is very interesting to me. A lot of my work is about the failure to actually go through with things, but I am always trying to see if I can, whether it be exercise-wise, performance-wise, sexually, or otherwise. I am always interested in what one body can do. It seems so small and meaningless. I feel like a speck of dust in time, but the smallest event can overwhelm me for days and weeks or stay with me forever. What are some of the long durational performance or projects that you’ve enjoyed? I really love Tehching Hsieh’s one-year performances, especially the Time Clock Piece in which he spent a year in 1980 punching a time clock every hour on the hour and taking a photo of himself. I also really love David Blaine’s performance, “Vertigo,” in which he stood on a 100-foot pillar for 35 hours. People always think I’m joking when I say I love David Blaine, but I find his endurance tests so fascinating. Jaime Chu is a writer and translator from Hong Kong currently living in Brooklyn. Image still from a video by Emily Raw. Would You Rather Be Thanksgiving Food Or A Thanksgiving Decoration? Wouldn’t It Be Nice To Have A Fireplace?